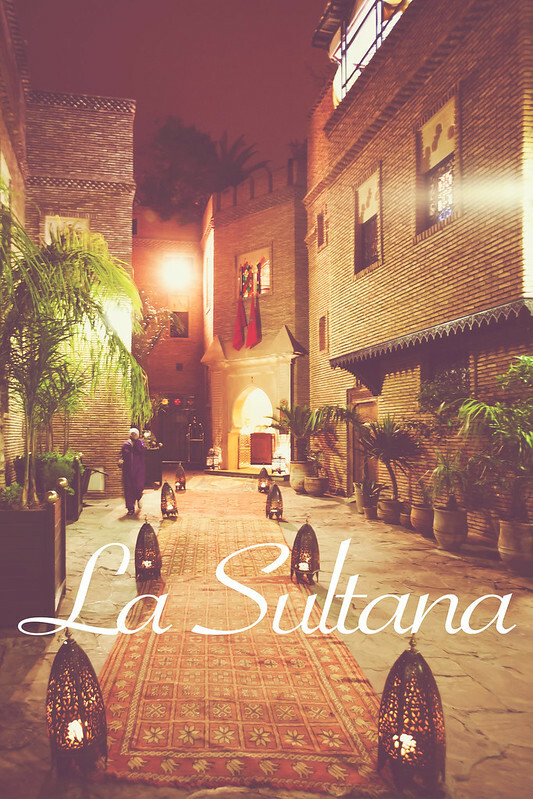 La Sultana Marrakech is a prized sanctuary in the heart of the royal Kasbah. As our private car pulled right to the carpet-lined walkway of the hotel, we were welcomed by a beaming bellman standing by to help us with our luggage. 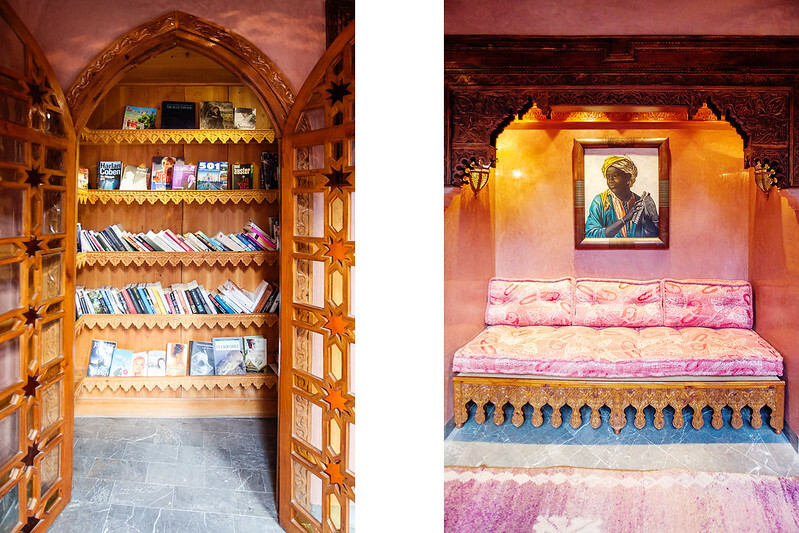 The other side of the hotel’s main door is a modest lobby, which did not give us any hint of the splendor that waits behind another set of doors. 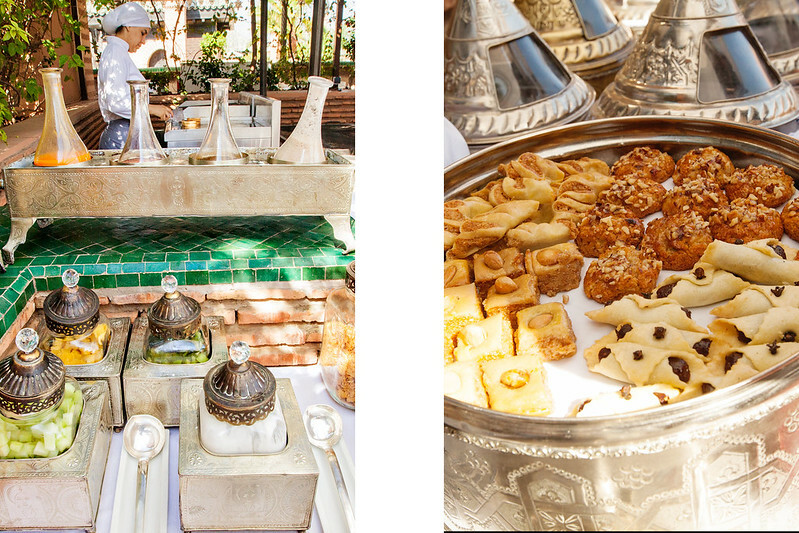 Mohamed, the concierge, led us to the rooftop terrace for breakfast even before checking us in. Since we got to their hotel at around 10am, he figured we haven’t had a chance to eat breakfast yet; and he was right. The rooftop was breathtaking! On one side, you can see the snow-capped peak of the Atlas Mountains and on another side; you can see the Tombs of Saadian Kings. 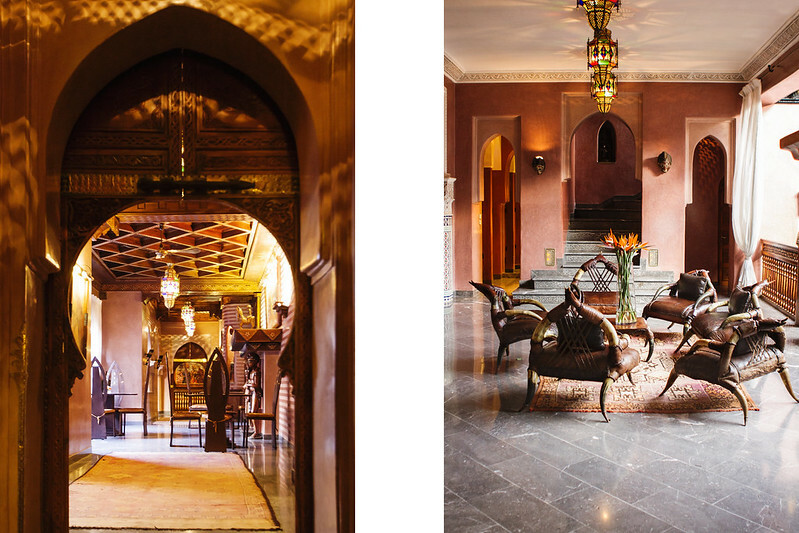 Mohamed checked us in after breakfast and gave us a tour of this luxurious 28-room boutique hotel. 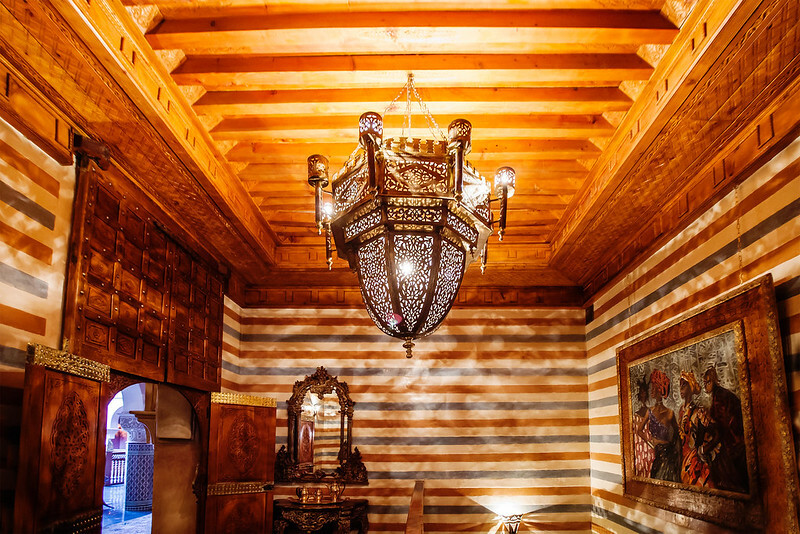 It turned out that La Sultana is made up of five riads (Riad Saadia, Riad Bahia, Riad Shahrazad, Riad Sabah and Riad Almohad), each intricately and richly decorated to match a certain theme. 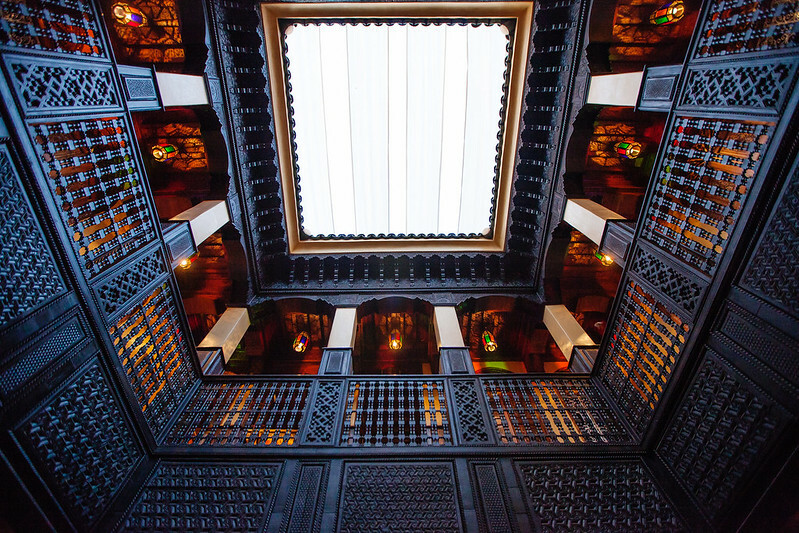 As we walked deeper into the web of Riads, the noise from the bustling street outside disappeared into serene silence. 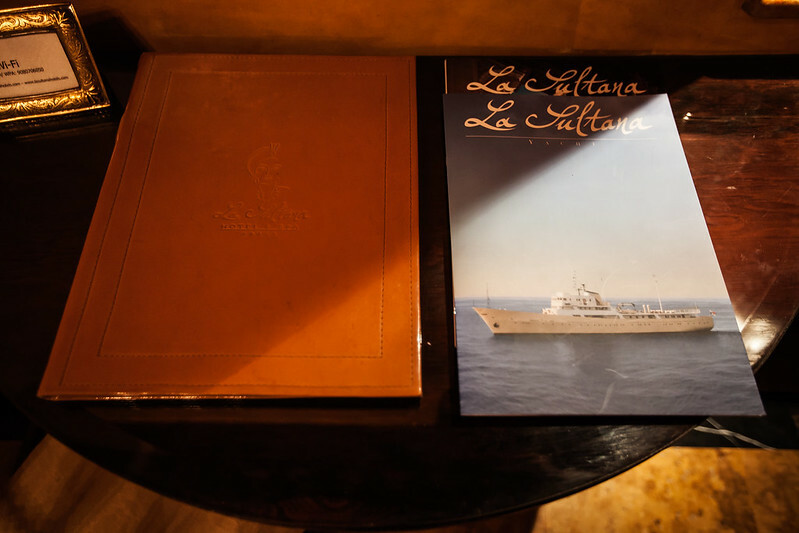 It seemed as if we were transported into a different place – an oasis. We were no longer in Marrakech, with streets full of honking motorcycles, group of tourists walking by, and vendors peddling their goods. 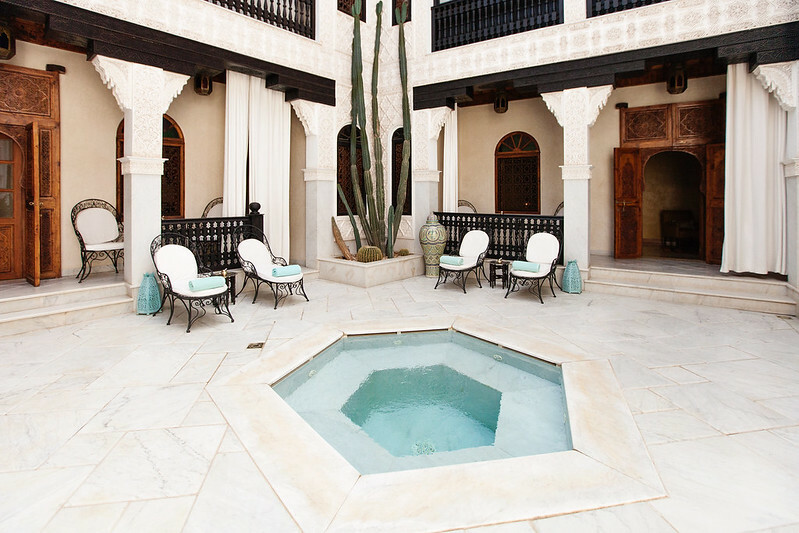 The lobby and the adjacent hallway that lead up to this palm-fringed pool are all part of the Riad Almohad. 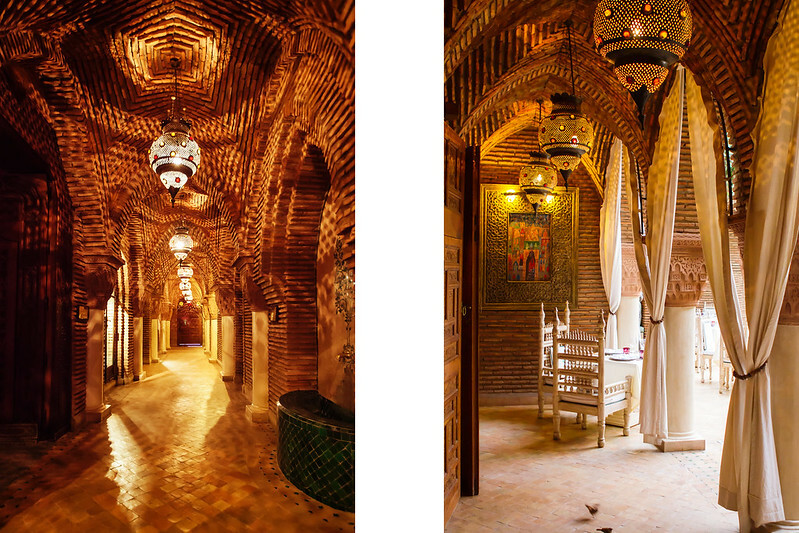 The elaborate Mudejar brickwork in earthy tones and ornamental metals adorning its walls and ceilings provide wonderful sense of texture and warmth. 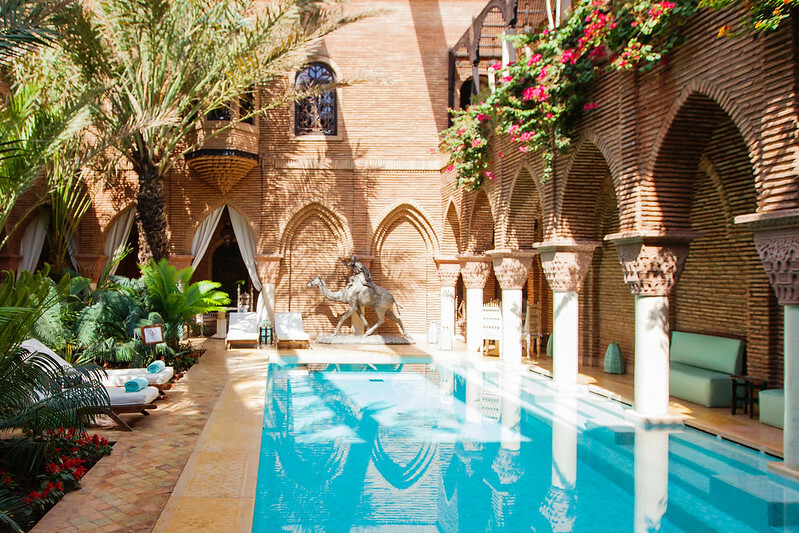 Horseshoe arches, a staple of the Islam architecture from which the Mudejar style was derived from, are also prominent in this Riad especially in the pool area where you can see them side by side supported by symmetrical white columns. 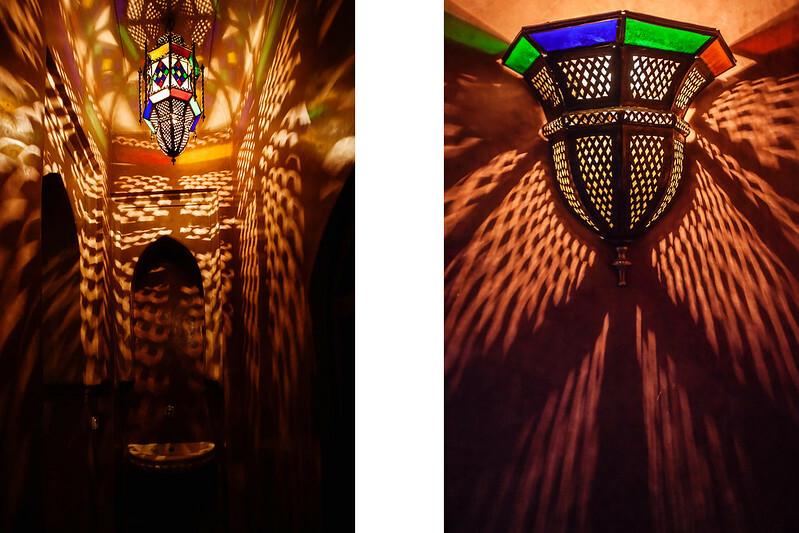 These intricately designed Moroccan lamps make this Riad even more dramatic when lit due to the shadows they cast. 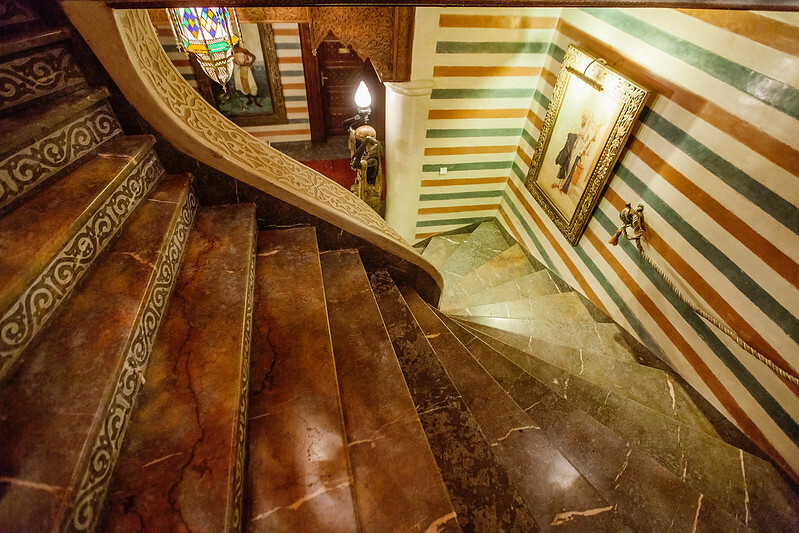 Several more steps and we found ourselves in Riad Saadia. 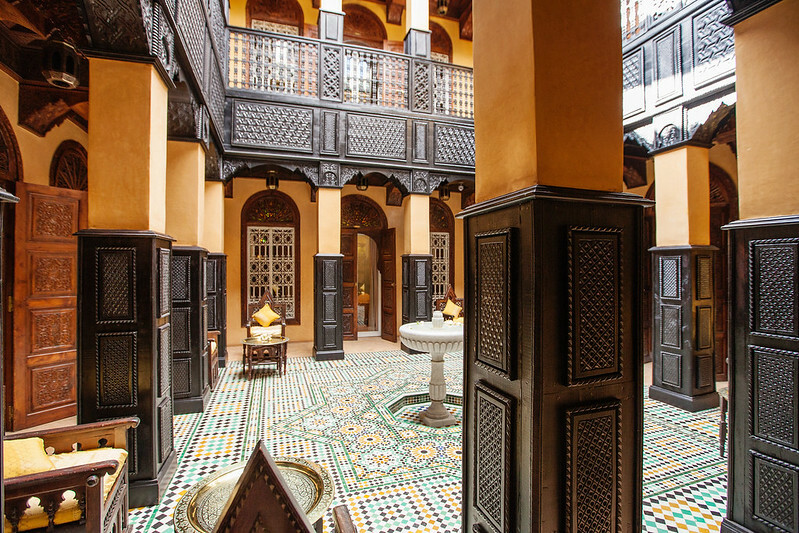 Painted in warm colors, this Riad boasts cedar wood columns and balustrades contrasted by the bright-hued mosaic-tiled floor. 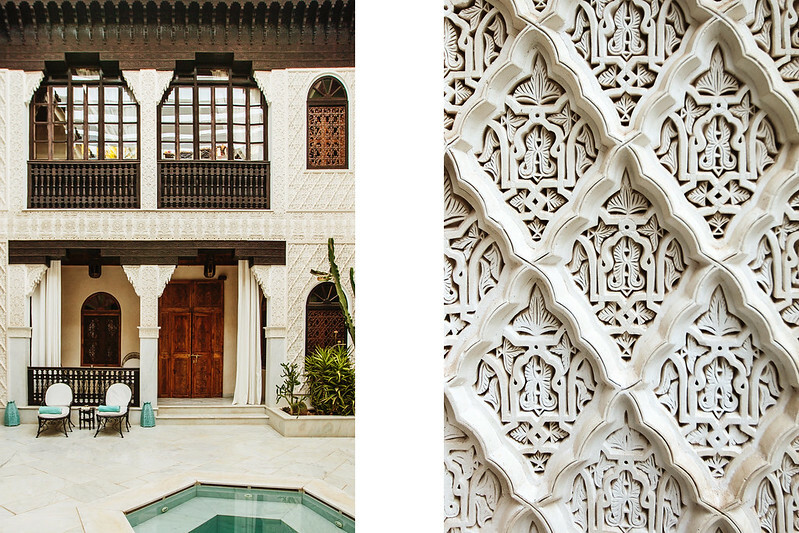 This tile work style consisting of geometrical patterns is known as Zellij and is one of the characteristics of Moroccan architecture. You can see more of this type of tile work next door from the hotel in the Tombs of the Saadian Kings. 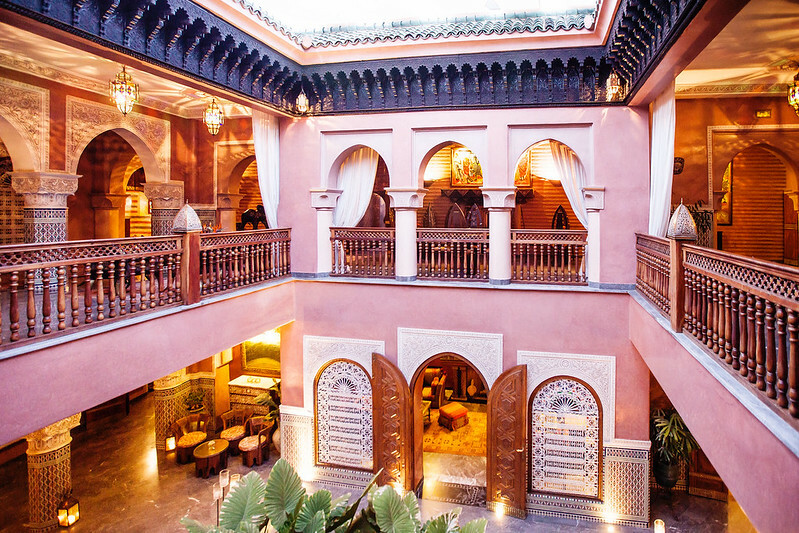 Riad Bahia is noticeably different from the previous Riads we’ve just been. 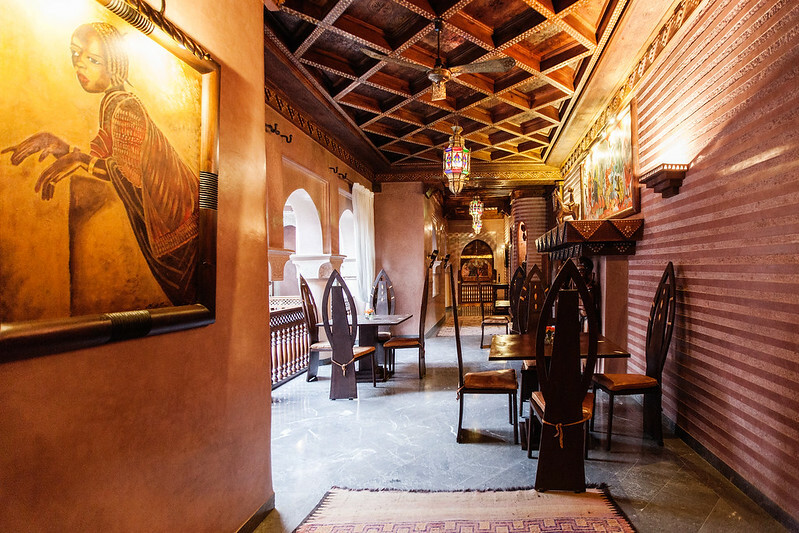 Its center patio is full of white polished plaster surfaces from its floor through its columns and walls filigreed by stuccowork with accents of hand carved wooden windows, ceiling and balustrades. 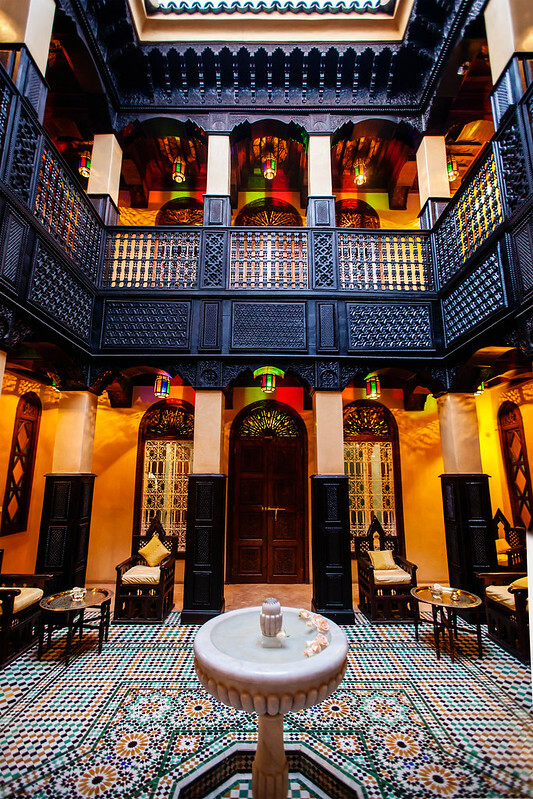 For me, these accents give the Riad an even more interesting aesthetic. 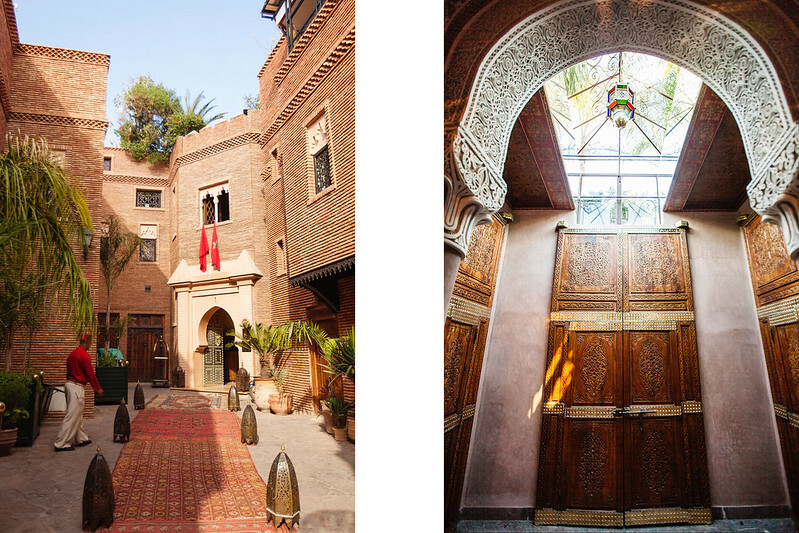 Although the details may not be as rich as that of Riad Almohad and Riad Saadia, this Riad is still as stunning. I wasn’t able to observe enough in Riad Sabah. 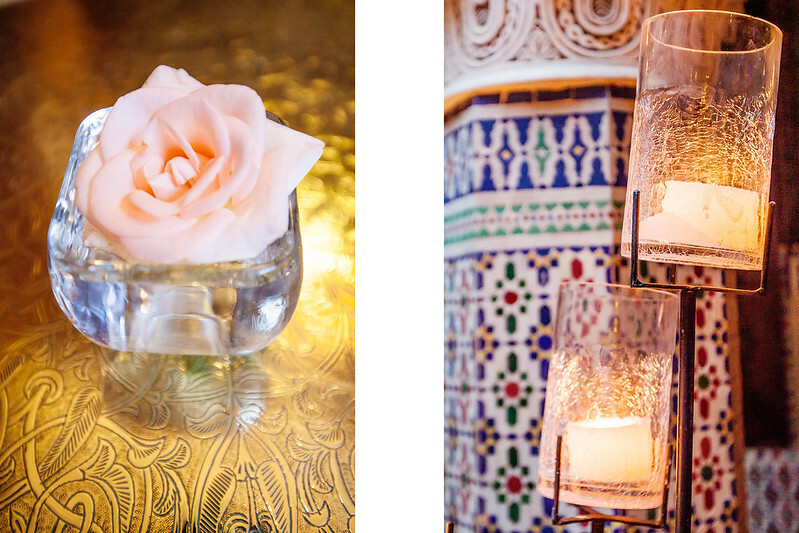 In fact the photos I have below are those that I think belonged in this Riad. 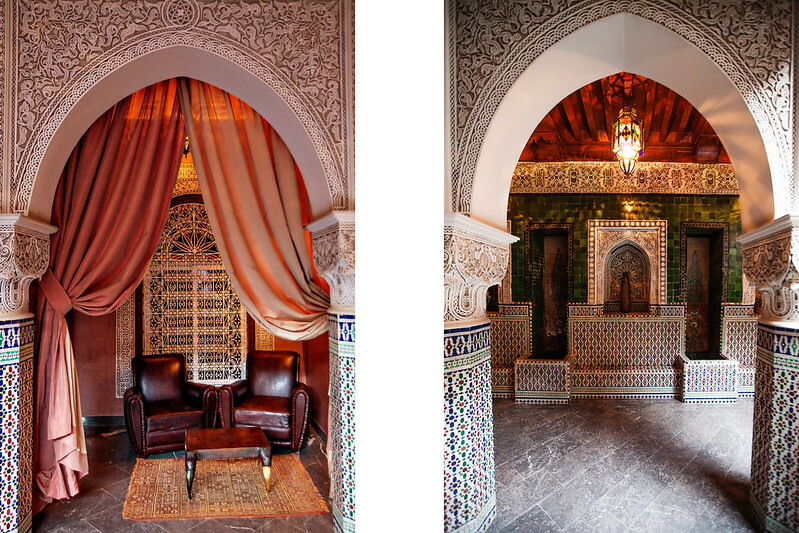 They looked different from the other Riads’ design and décor. 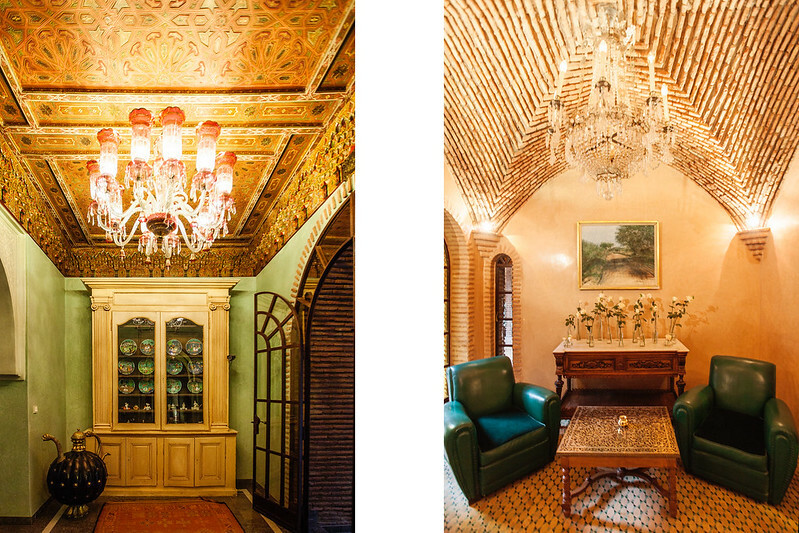 Green couches, green walls and a distinctive chandelier. 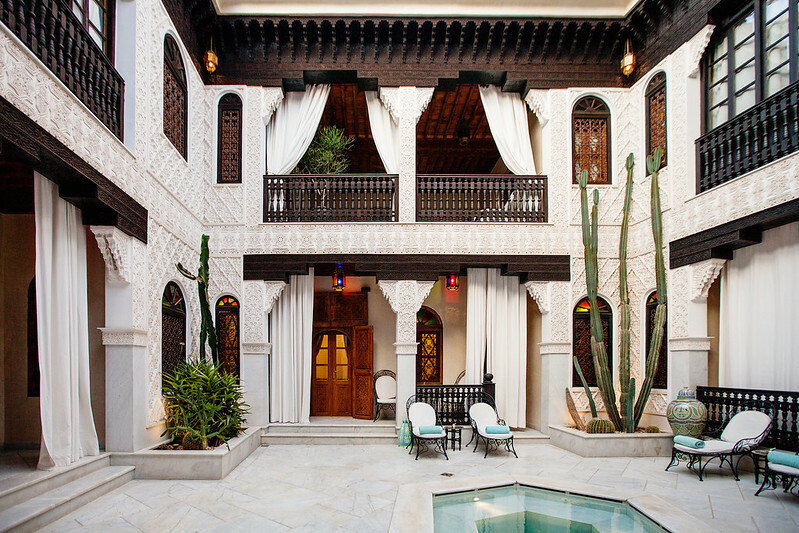 What do you think this Riad’s theme is? 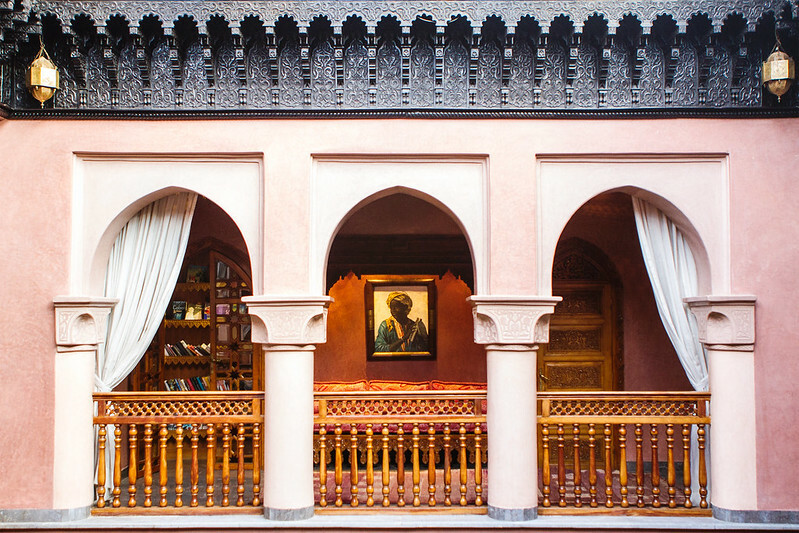 The last Riad in the hotel is called Riad Shéhérazade. In my opinion, this is absolutely the most beautiful one out of all the five. 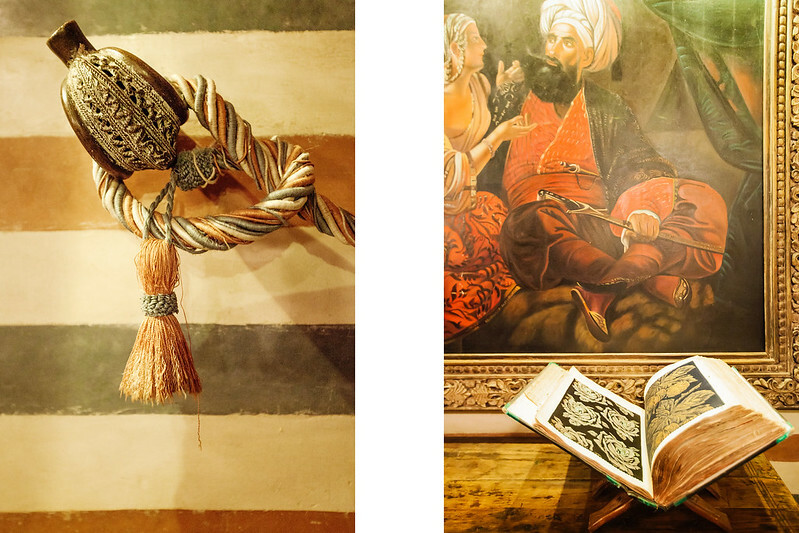 It made it seem like I was in a museum exhibition with individually handpicked antique and one-of-a-kind pieces that proudly presents African design. 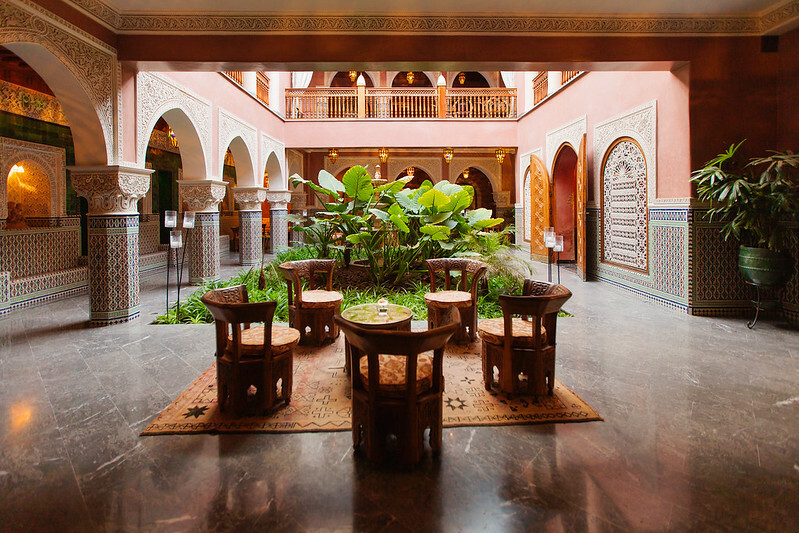 The Riad had a large sitting area on the first floor with plants in the middle that make you feel like you’re in the jungle. 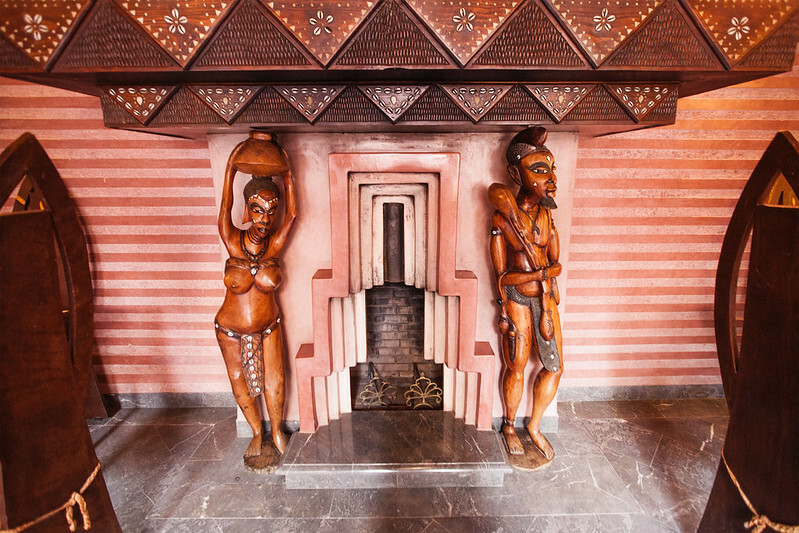 Its walls are embellished with paintings of beautiful African ladies. 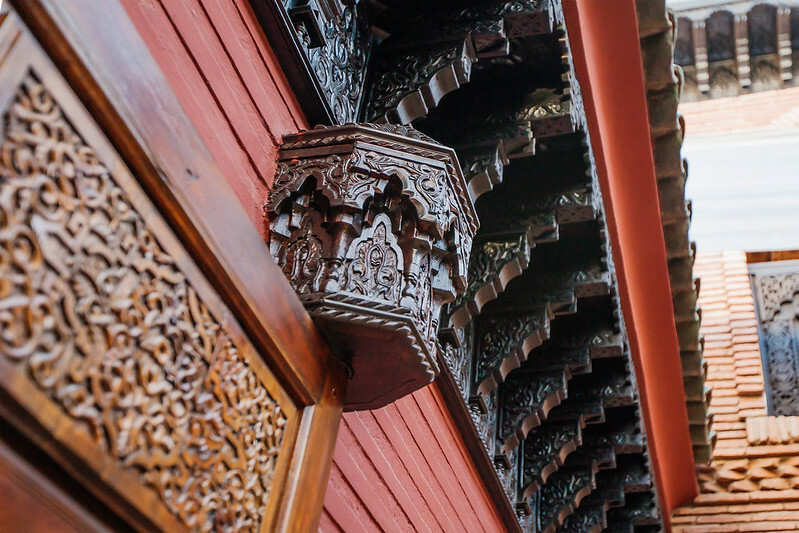 Also, you can tell that its furniture is made from exceptional craftsmanship. 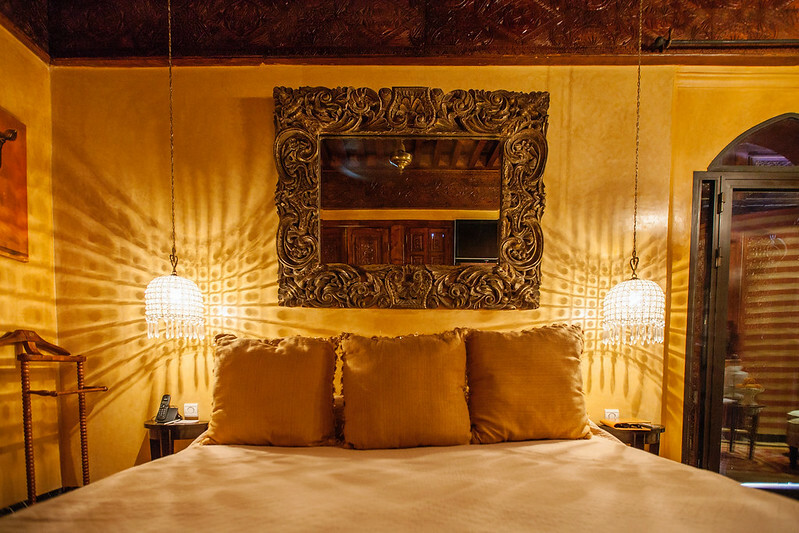 Their bespoke lounge sets are voluptuous and smooth with strong angular edges that reminded me of animal tusks. 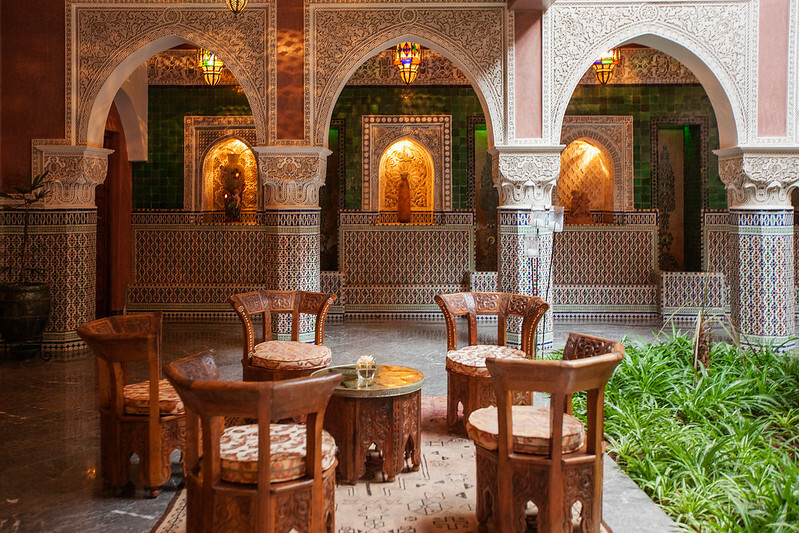 It’s walls and columns are ornamented with Zellij tiles and its arches bejeweled with stuccowork. 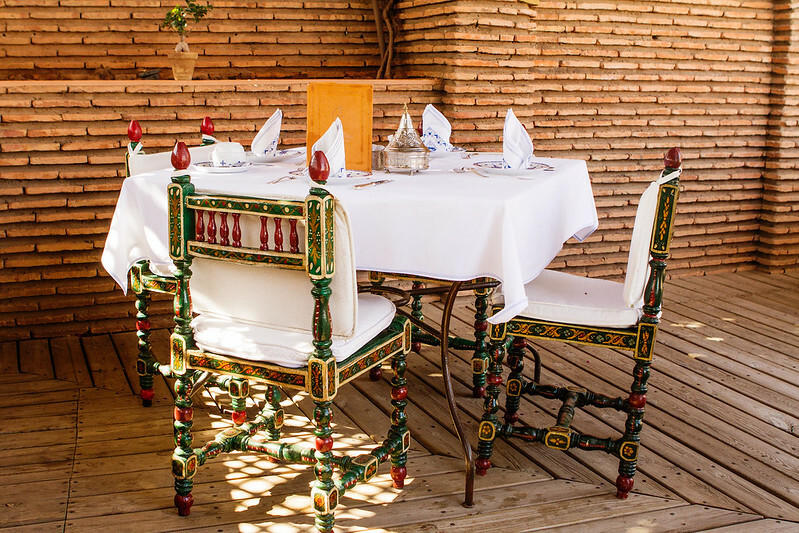 In every direction I looked, there was one word that could describe this place – exotic! 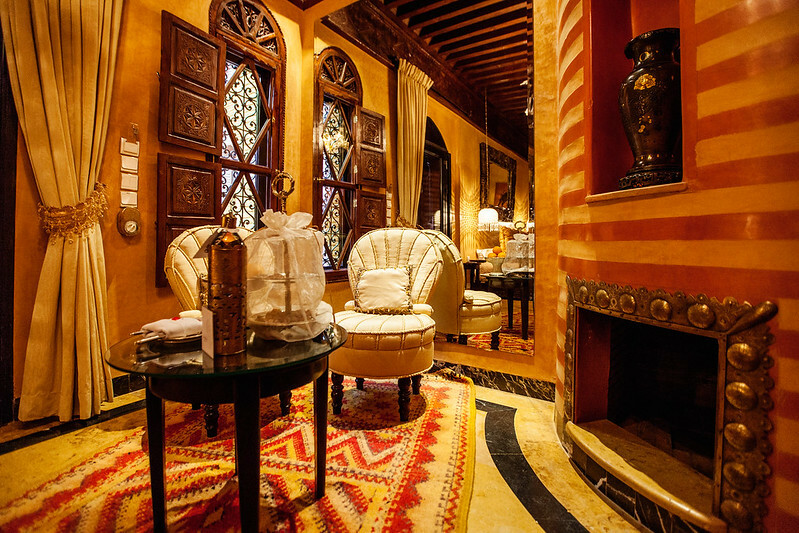 Our room, named Koudou, is within Riad Shéhérazade. 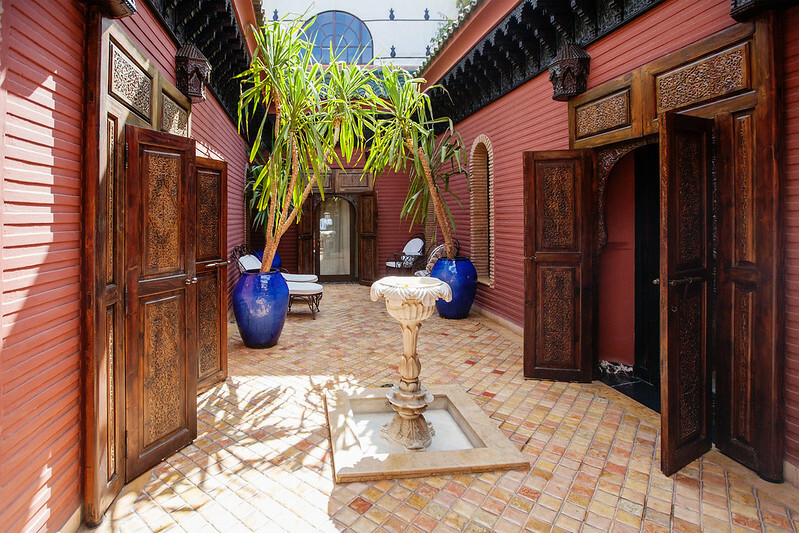 It is tucked in a secluded patio in one of the wings of this Riad. 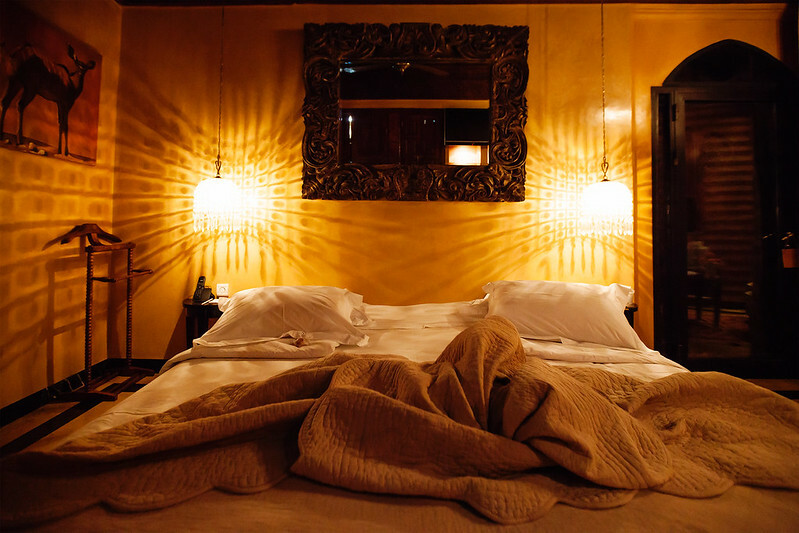 It offers a luxurious King Bed with silky linen that will make it hard for you to get out of the bed. There’s also a fireplace in the room, which we never used as the temperature in late May / early June was perfect for us. 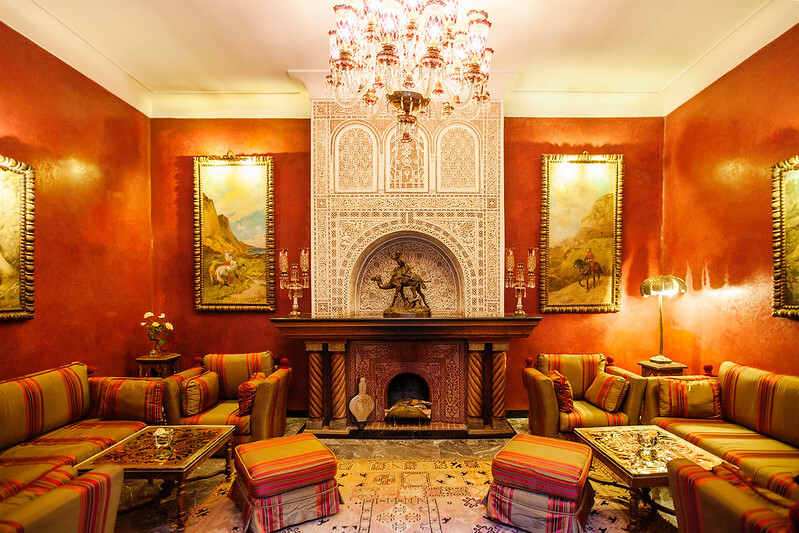 The sitting area was a little small but it’s still full of personality with its striking African rug and delicious Moroccan sweets waiting on our coffee table whenever we return to our room from a long day of sightseeing. 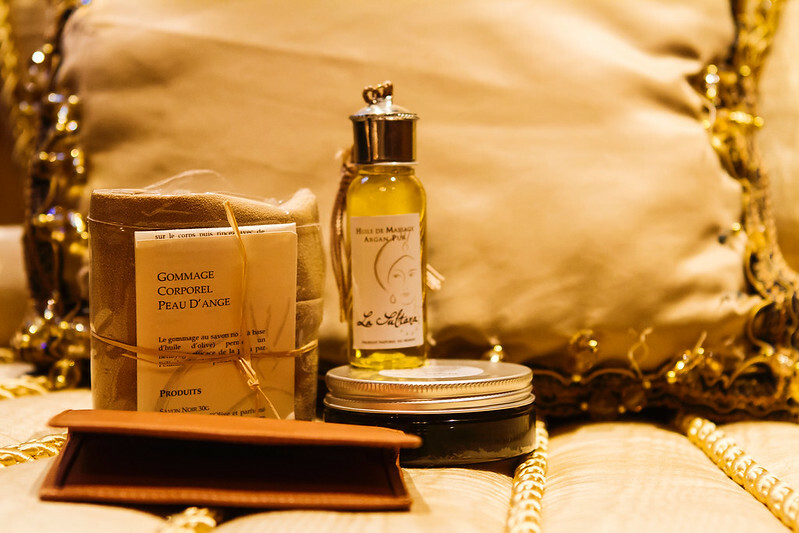 On our last day though, we had an even lovelier surprise waiting for us on the sofa chair - a jar of body scrub, a bottle of argan oil and a cardholder made of leather. 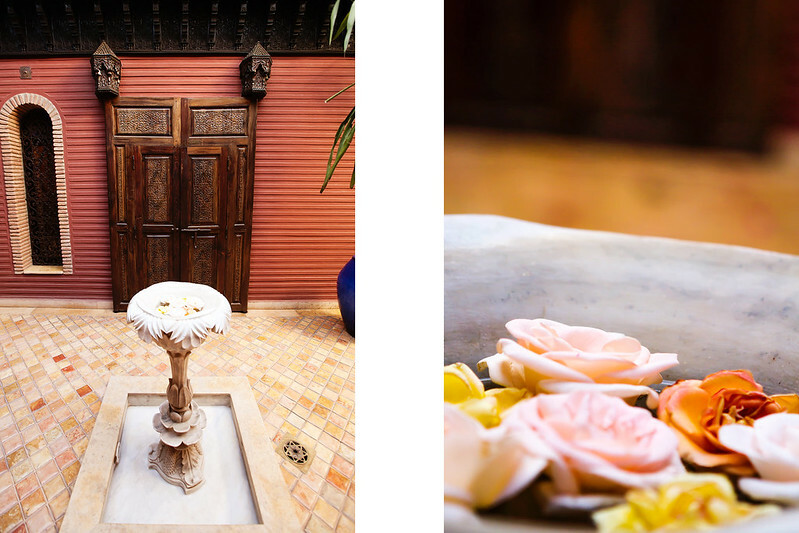 To sum it up, this hotel is all about its calming Riads, pleasing aesthetics, exceptional attention to details, and warmhearted service.